News Corp.’s money-printing unit Fox News stands to make a $1 billion profit this year largely on the mouths and mugs of two men: Bill O’Reilly and Sean Hannity, both of whom plan to extend their contracts with the network through the 2016 elections. This Monday, for example, The O’Reilly Factor and Hannity ranked one and two against all other cable news shows, with 2.8 and 2.1 million viewers respectively. Network boss Roger Ailes would be a fool to let them go the way of Glenn Beck. The new contracts are expected to be signed by next week, and the New York Times reports that each host will likely make more than $10 million a year. 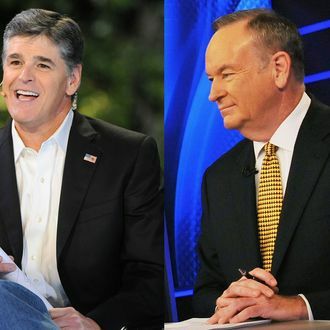 Working through the next presidential election would bring O’Reilly and Hannity past the two-decade mark with the network, as they’ve both been Fox News characters since the channel started in 1996. And should the ensuing years bring peace and prosperity under President Mitt Romney, maybe they’ll just transition to cooking tutorials.